An off-duty police officer was credited for saving the life of a driver during an emergency that resulted to a rush-hour crash on Port Mann bridge. New Westminster Police Const. Todd Sweet was driving home when he witnessed a vehicle crashed directly into a concrete barrier. Sweet assisted an off-duty officer with the Vancouver Police Department and members of the RCMP pull the man from the vehicle. With the help of first aid training, the skills and knowledge are indispensable tools to help save lives during emergencies. Sweet performed CPR as the others cleared the airway of the driver, stabilize the spine and redirect traffic from the scene to allow the entry of the ambulance. The NWPD officer executed CPR for 20 minutes as the ambulance moved through the traffic jam. Once the paramedics reached the scene, the man was transported to a healthcare facility to undergo surgery. At present, he is currently in the phase of recovery in an intensive care unit. While NWPD Chief Dave Jones applauded the efforts of Sweet, the constable said that he and the other officers were in the right place at the right time. According to Sweet, whether you are on shift or not, you must react and do what you were trained for. 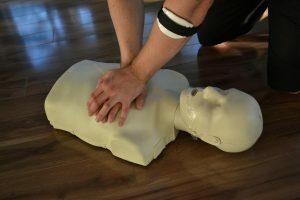 Should I enroll in a first aid course?